Submitted by Migrate Wizard on 2014-08-18 09:43. The package include class icons for NWN, SoU, HotU and 1.69. 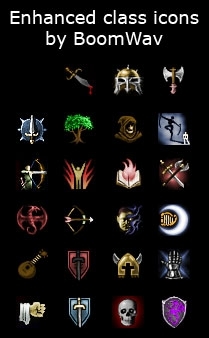 The icons were all colorized to add a new dept in the game. Some were also fixed. 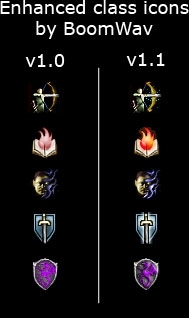 The SoU class icons had no alpha. That caused those icons to appear on a black background instead of a transparent one. Special thanks: I'd like to thanks The Amethyst Dragon for his idea. Without his icons, I wouldnt have tought of creating my own. Here's a polished version of my icons. Thanks ShaDoOoW for your precious comments! You are free to mix versions if you like! Just overwrite the icons in the override folder to install. ShaDoOoW special request. Wizard icon in blue hue. I hope it'll please everybody! Here's an alternative to the blackguard icon. I made it closer to the standard apparence. I kind of prefer it this way too.